On Tuesday 15 January 2019 at 8am myself, fellow skipper Warren Tarboton and Cherie Lawrence from Bayworld departed from the Port Elizabeth Harbour on our research/filming and backup boat Winkle. We were off to the Bird Island group which is 38 nautical miles from Port Elizabeth. 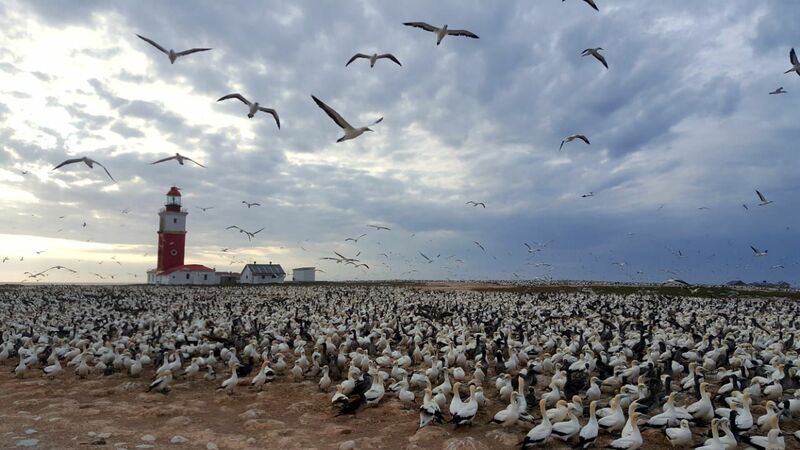 Our primary goal for the day was to pick up Ilana Engelbrecht and Makabongwe Sigqala who had spent nine nights on Bird island conducting research on the gannet colony. 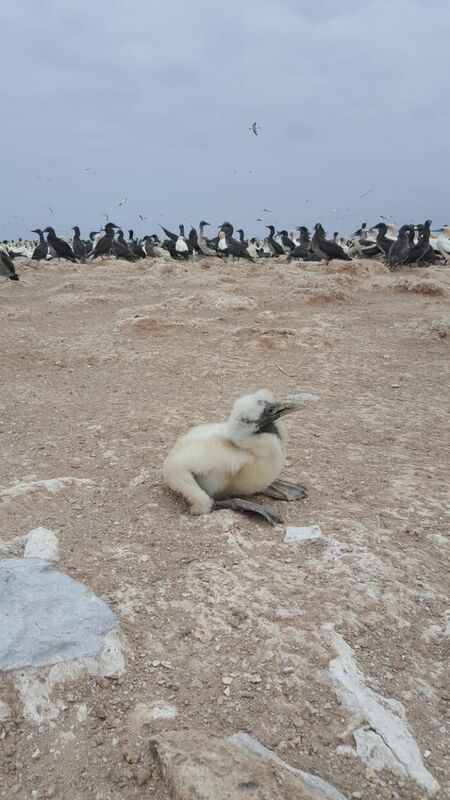 Bird Island is home to the largest breeding colony of Cape gannets with approximately 280 000 individual birds on the island. During this expedition Ilana and Makabongwe fitted GPS tracking units onto 20 Cape Gannets to record there movements too and from the island. Finishing their field work just in time, it was the last chance for them to be picked up from the island as strong easterly winds and rough sea conditions were forecasted for the following 5 days. 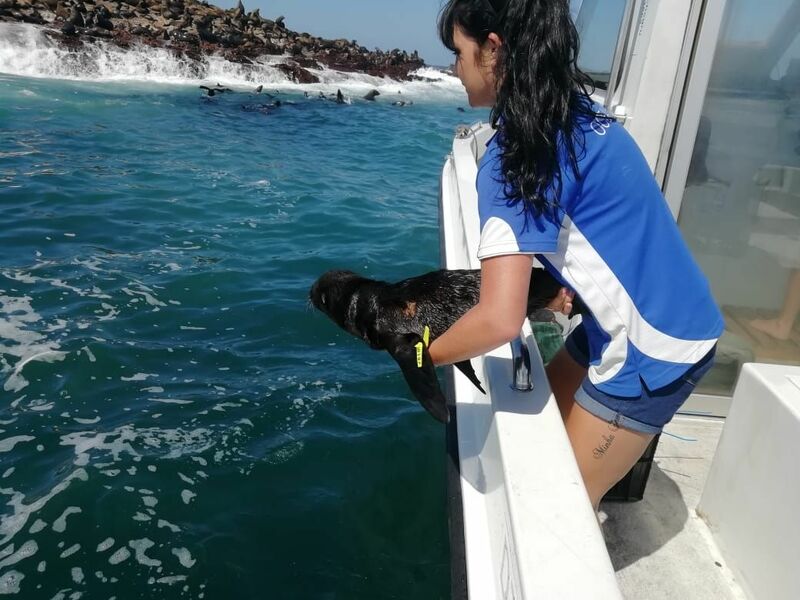 Aside from picking up Ilana and Makabongwe, we had precious cargo on board in the form of 4 Cape Fur Seals who had been rehabilitated at Bayworld and were now ready to be released back at there colony at black rocks from which they came. 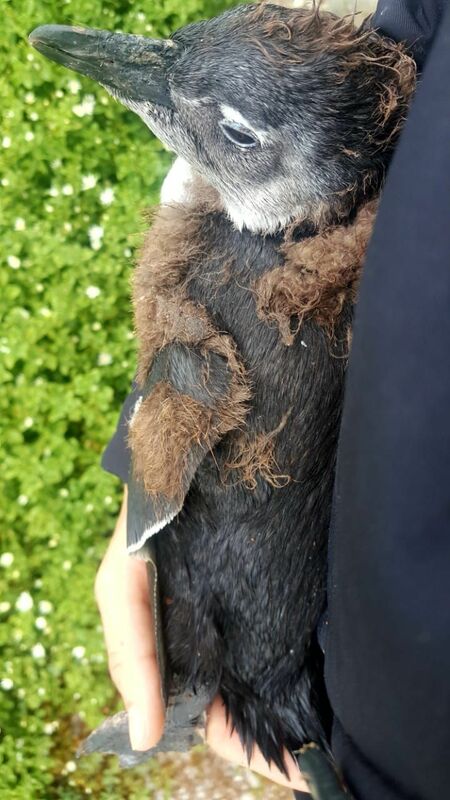 Young pups often get washed off of Black rocks during rough sea conditions and end up stranded in poor conditions on nearby beaches. Fortunately for these four they were found and through hard work and dedication from Bayworld's staff have been given a second chance. Upon arriving at Bird island it was immediately apparent that the swell was too big for us to collect Ilana and Makabongwe from the island as the channel that we normally enter through was completely closed off by breaking waves. 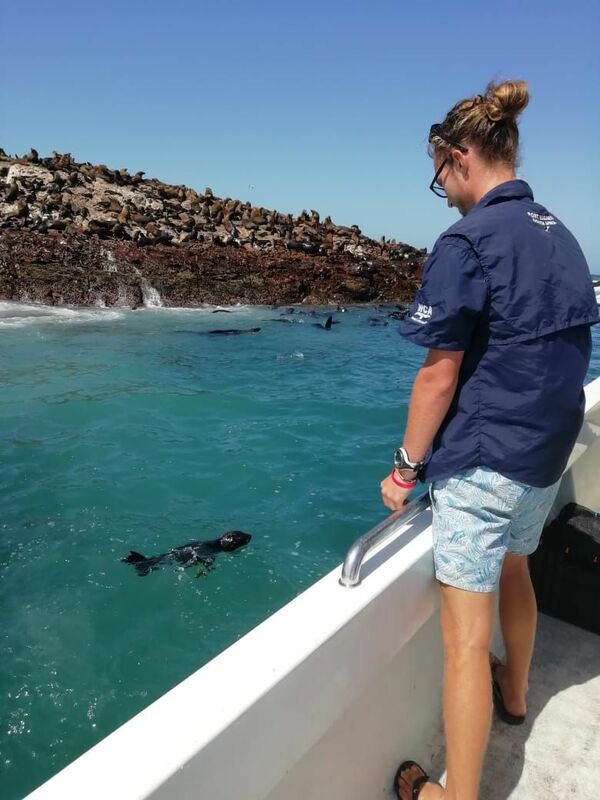 We proceeded to release the seal pups, which much to our delight, all made a B-Line for the rest of the Colony on Black Rocks as soon as they hit the water. We retreated back from the island and waited two hours for the swell to subside before returning the have another look at the channel which had opened up slightly at the point, yet still not enough for us to get through. With a strong South Westerly wind starting to pick up and it still being close to high tide we decided to head around to the back of the island and take the calmer yet shallower route to the pick up point. 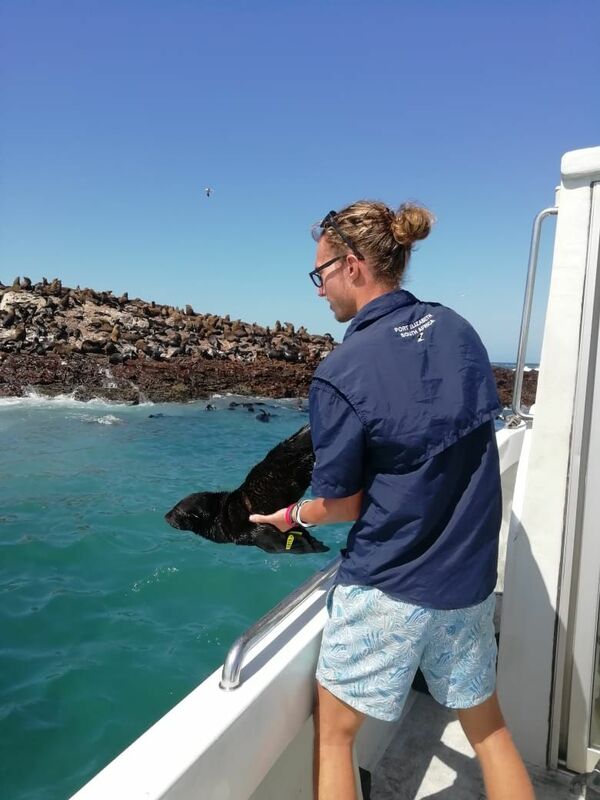 We manged to navigate through and over the reefs to pick up Ilana and Makabongwe together with some African Penguins and Cape Gannets that were in poor condition and destined for SANCCOB sea bird rehabilitation centre. With the tricky bits done we started the 2 hour trip back to port which because of the unforecasted and strengthening South Westerly became a three hour trip after having to run inshore to avoid the bigger swells. 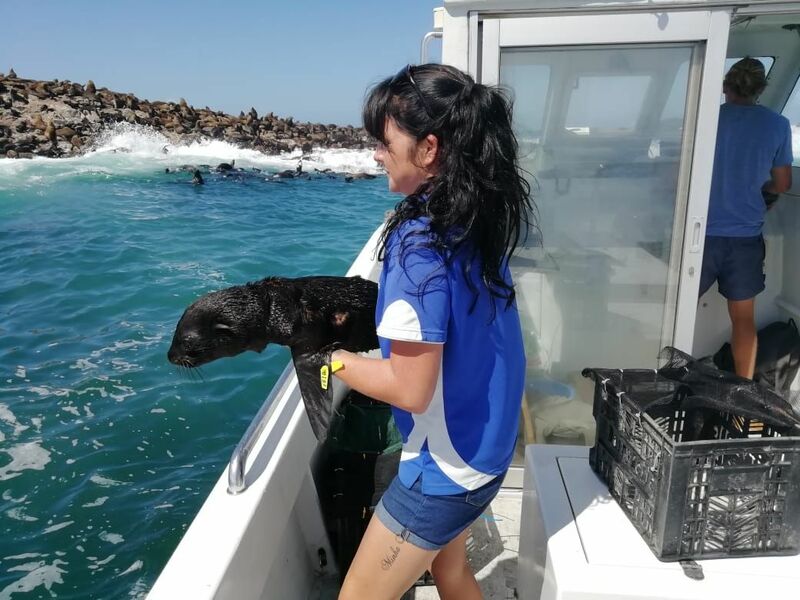 We feel privileged to be able to assist both Bayworld and the research team in their efforts to protect and conserve the marine life of Algoa Bay and look forward many trips in the future.  We have added a few photos kindly sent to us by Ilana, taken while she was at Bird Island. 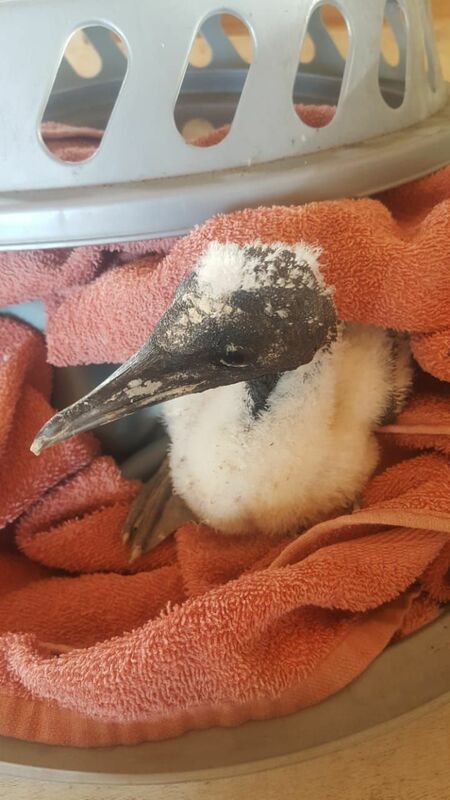 The Cape gannets on Bird Island and the chicks of gannets and African penguins that are rescued after being abandoned at nests as the parents spend more time at sea foraging. This is due to the lack of resources.